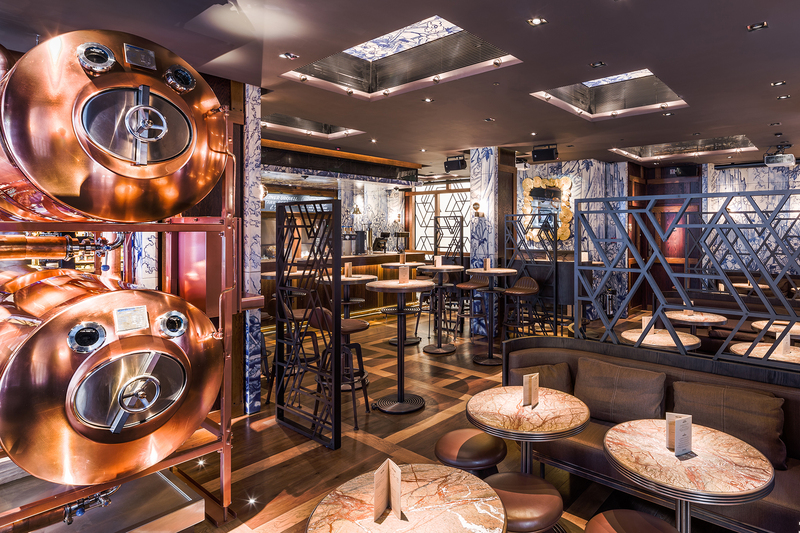 Occupying the former The Endurance site in Berwick Street, Duck & Rice became last year the first public house conception by visionary and perfectionist Alan Yau. Light IQ were approached during the construction of the project by the client's team, who required a lighting specialist to take the project to its completion. Light IQ undertook the challenging task of finalising and styling the lighting design to Yau's satisfaction. The final stages of any lighting design project are very often the most important. It is during this period that the commissioning of the lighting installation takes place: identification of contractor's errors, changes of lamp specifications, swapping of optical accessories and lenses; all to optimise the lighting effects throughout the interior spaces. Once the commissioning is finished, the focusing and styling is the very last stage of the lighting design process and it is crucial for the success of any architectural environment, as light has the power to enhance or ruin the atmosphere of such environments. Light IQ offer Commissioning and Styling as a stand alone service, if required. In the case of Duck & Rice, the challenge was to take the lighting scheme from construction to completion in less than 2 months and the task included several mock ups to confirm that the lighting effects proposed for the project were fully satisfactory and appropriate. 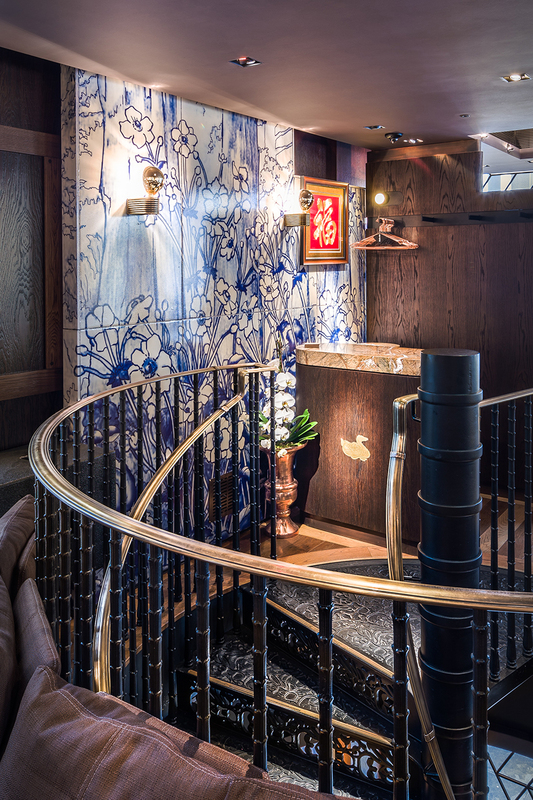 One of the major components of the lighting scheme at Duck & Rice is the decorative lighting. The Turkish interior design firm Autoban had a very specific vision of what the ceramic tiles would be rendered with, in terms of lighting. A selection of more than a dozen different lamps and light fixtures was proposed to the team, before proceeding with the final choice. The result is a series of large-scale gold mirror lamps that provide a very architectural glow to the tile-covered walls. The ceiling tiles, by contrast, are lit by discreet wall mounted up-lighters with halogen lamps. 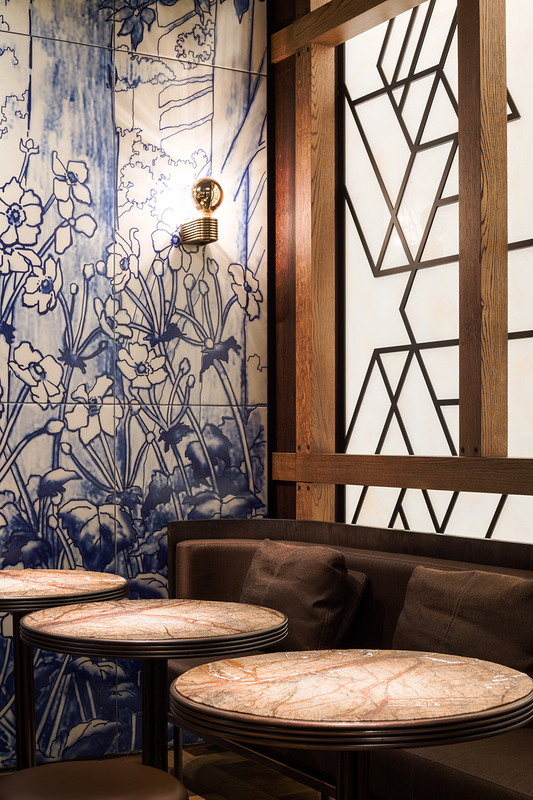 Both options provide the best colour rendering to the hand painted tiles, as well as optimum dimming conditions, an essential aspect of all high-end restaurants. The styling of the lighting also included aiming and focusing every single adjustable downlight and spotlight to a specific surface or item. 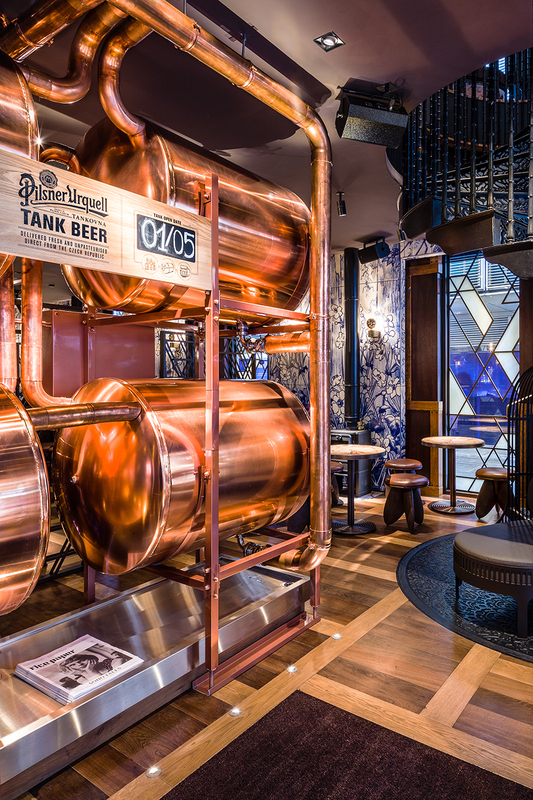 These included the tables, the bar counters, the numerous bottle displays and also important elements of the interior design: wooden columns, fireplace frames, mirrors, as well as special features such as the giant copper beer tanks at the entrance and the beautiful cast-iron staircase. The final result is a very intimate but contemporary venue that attracts a wide range of punters. The ground floor has a welcoming and comfortable ambiance, which matches the sublime elegance of the interior design. The upper floor dining room continues the elegance of the lower floor. 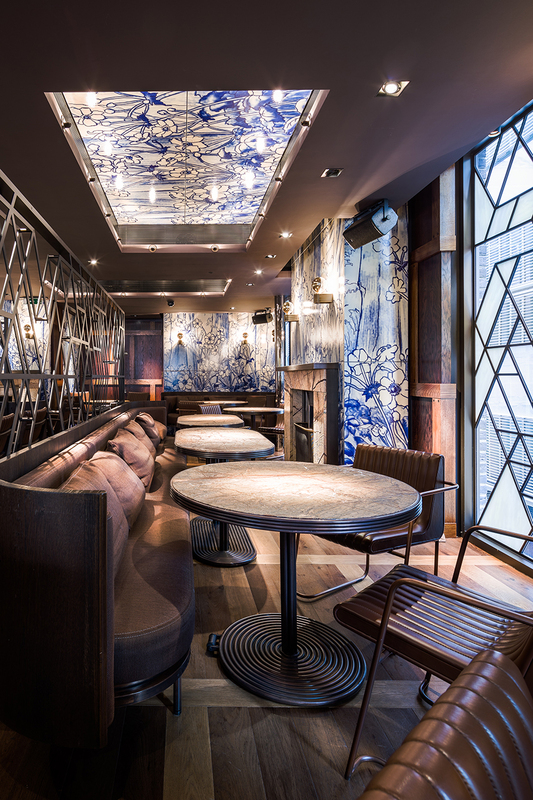 It is cosy and warm, with a lower ceiling height and more wall lamps than the ground floor in order to provide an even more intimate atmosphere for dining - a very important component in all Alan Yau's venues.